Before there were craft breweries in every zip code, even before the wild bratwurst was domesticated, Wisconsin was a land of plenty—which is what lured the Chippewa, the Winnebago, and European voyageurs and fur traders. After a few armed misunderstandings with the French and the Indians, Wisconsin ended up as part of the Royal Province of Quebec (really? cool), then as part of a country called America. After gigs in the Northwest, Illinois and Michigan territories, we got our own identity in 1836 when President Jackson signed the bill. Henry Dodge was appointed to govern the Wisconsin Territory, which included parts of Iowa, Minnesota, and even the Dakotas. Governor Dodge, a former sheriff, soldier, and dragoon, became a hero in the War of 1812. He had also been recruited by Aaron Burr in an attempt to create a new country (The Burr Conspiracy). So we had a governor who’d been indicted for treason in his younger days. Appropriate for a state that would later give rise to picketers, progressives and protestors. Governor Dodge is still remembered today with towns and counties across Wisconsin, Iowa and Minnesota being named after him. Not to mention, Governor Dodge State Park outside of…wait for it…Dodgeville. Just a correction: Neither Wisconsin nor Wisconsin territory ever owned the UP. 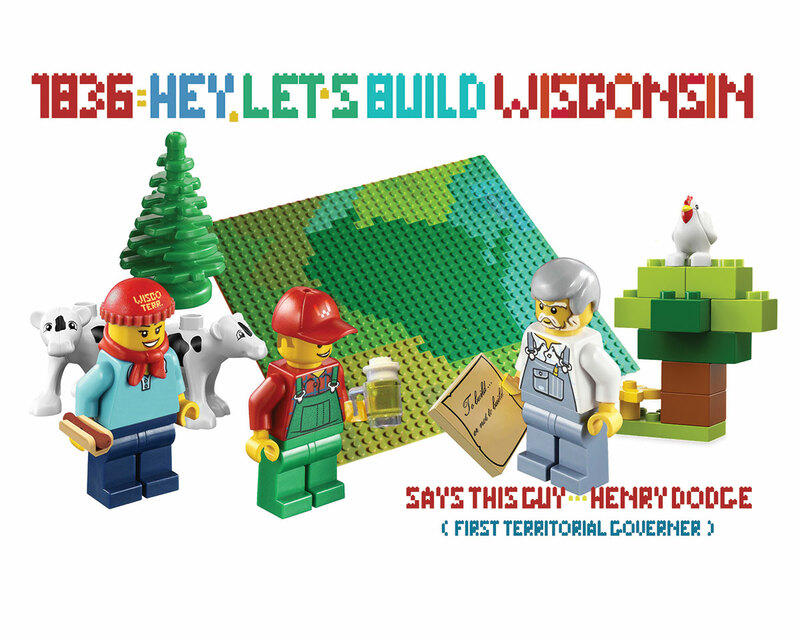 All of what today is Wisconsin was a part of various territories until 1836. It was all a part of the Michigan Territory from 1818 to 1836, and before that the Illinois Territory and before that the Indiana Territory. The UP went with the new State of Michigan in 1837 and never was a part of the Wisconsin Territory. A minor point but necessary. The subject of my master’s thesis, James Duane Doty, fought hard to keep the borders set by the Northwest Territory in 1787, but Wisconsin’s southern border was moved north to give Indiana and Illinois more ports on Lake Michigan. The UP and territories west were attached to other territories and states because Congress felt, in part, that Wisconsin Territory would be too large a territory otherwise. Politics also intervened to reset Wisconsin’s current boundaries over Doty’s heated objections. The Ohio-Michigan dispute over Toledo is often credited for Michigan receiving the UP as compensations for moving the southern border up from that set by the Northwest Ordinance. Some of those living at that time also brought up the point of Wisconsin Territory being too large to govern effectively if the entire UP was attached. Also, the ties between Mackinac and Detroit were as old as anyone can guess.